This children’s book is both adventurous and totally lighthearted. 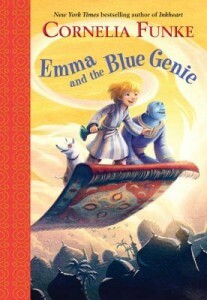 Nothing to take seriously except to enjoy the ride on the magic carpet, and the battle with a mean genie. It’s totally benign, and has outstanding illustrations scattered throughout. The plot involves a kind genie who has been tricked by an evil genie, and needs to get his power back. I’ve been working my way through the tamer writing of Cornelia Funke, and each children’s book I read has inspired me to find more. I know her classic trilogy Inkheart is not my cup of tea, but she certainly is a great story teller. This book makes a nice easy chapter book for third graders, aged 9 and 10; at the same time it could easily be a fun read-aloud for 6- to 8-year-olds. I think it’s too easy for 11 and up. Imagination, humor, adventure – sometimes this is all we really need in a children’s book. And I forgot to add, great writing. The reason Cornelia Funke’s books work is that she is a master at creating beautiful literature in each children’s book, no matter what age she is writing for. Enjoy!